The other day, before Emily left, we went down to the Feria or market in Puerto Montt. This open air market is called Angelmo. The market is located at the actual Pacific Ocean port and is primarily a seafood market as well as an open air market section for tourists that sells trinkets and wool products. First of all it stinks like fish, which is to be expected, but on the good side the colorful small fishing boats dock here and it is kind of neat to see them all unloading their fish and the bounty of the sea. Emily, Andrew, Thomas and I bought a large 15 to 20 pound Salmon that was fresh off the boat. The fish monger filleted the Salmon and at our beckoning vacuum packed 1/4 of the fish and gave the rest of the fish to us to eat over the next couple of meals. 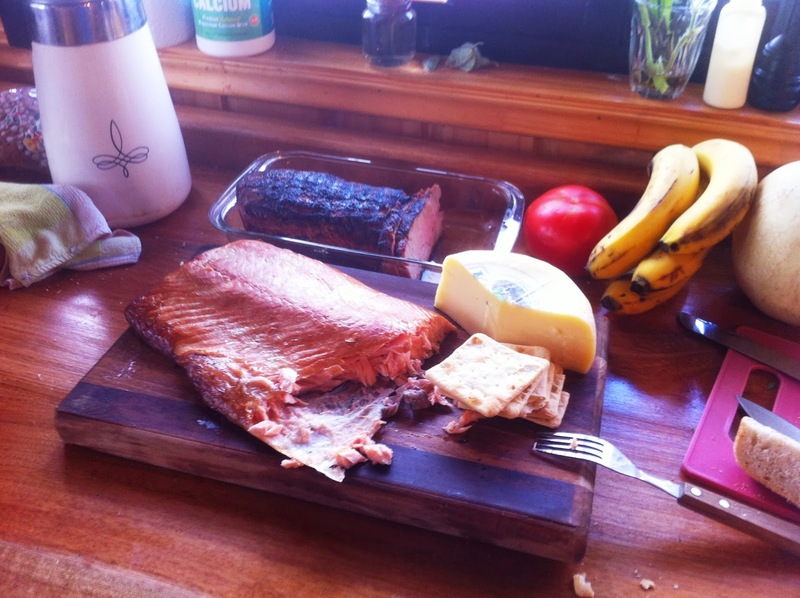 Emily of course loves Salmon, and she was kind enough to scarf down a good bit of Salmon over the next 4 days. The remaining section of salmon I decided to slow smoke as I was already cooking on the grill a smoked pork loin. I thought it would make for a wonderful dinner for a house guest we had visiting, but our guest did not show up until 12:30 midnight and the meal was a bust! His loss eh? Smoked Salmon, Pork Loin, Fresh Farm Cheese, and Crackers with a good Chilean wine. I did not season the salmon at all. Just fresh salmon and slow smoke. I was delightful, not harsh and strong flavored like I have had in the USA. Lori said that it could have used some salt, but I do not think so. I think it was perfect, especially with the farm fresh Coumey Cheese. If anything it would have been nice to have some capers, but overall it was easy to make and delicious. That REALLY looks good! A full meal with just some grapes and a bottle of wine... Great job! Lori sure would like some pointers on wool and spinning. The salmon was yummy.